3 Legged Thing has announced a new series of monopods that will sold alongside the company’s tripod range. In keeping with the tradition of giving its products names to identify them more easily, the three new monopods will be named Pete, Sid and Bob. The flagship model is Pete, which has been designed for photographers who demand support for large, heavy lenses. Constructed from 10-core carbon fiber and anodized magnesium alloy, the monopod weighs 450g and is intended to be the first choice for sports of wildlife photographers. The next model in the range is Sid – an exact replica of the carbon fiber monopod Pete albeit constructed from magnesium alloy. Weighing 532g, it’s designed for photographers on a lower budget or those who favour the alloy material to carbon fiber. Lastly there’s Bob – a professional carbon fiber monopod that has a 5 section design as opposed to the 3 section designs of Pete and Sid. Measuring 450mm long when folded, the monopod extends to 1.7m and has been made for travelling photographers with limited weight and size allowances. 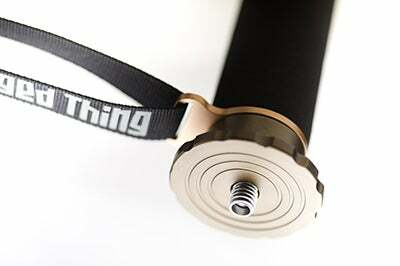 At the same time as announcing the three monopods, Three Legged Thing also unveiled the 1LT monopod case. Featuring a lined material to protect the monopod, it comes with pockets for memory cards and is large enough to fit a tripod head inside. At the time of writing, full pricing and availability of the new monopods was still yet to be confirmed.